ManageEngine Mobile Device Manager Plus supports managing your mobile devices from a central point. It allows you to perform Policy Management, Profile Management, Asset Management, App Management and Security Management of mobile devices. All communications to and from the mobile device is secured. As per Apple IOS MDM protocol, all iOS devices maintain a dedicated TCP connection with APNs at TCP Port 5223. Mobile Device Manager Plus leverages this to wake up a device using APNs. Device communicates with MDM server for available instructions at port 8383 using a secured connection. 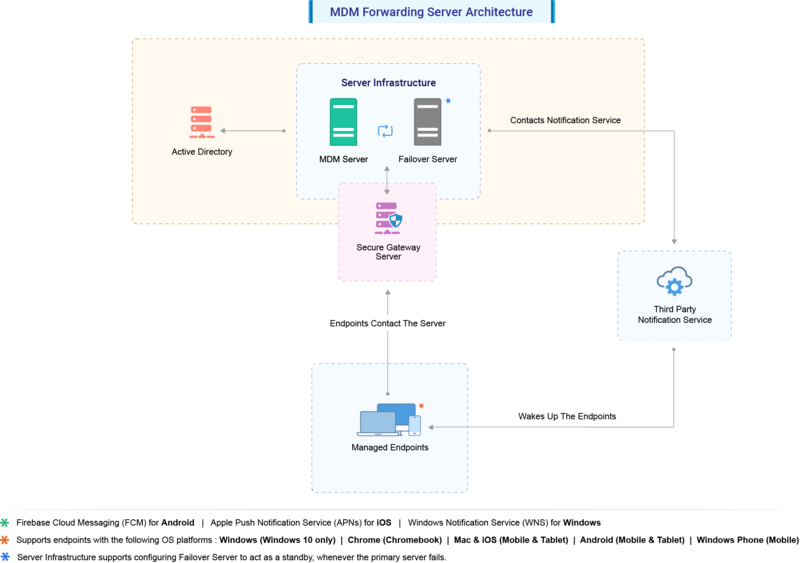 Executes the instructions and reports back to MDM server with the status/data at port 9383 securely. Assuming users' mobility, MDM server should be reachable via public IP address. You should NAT your internal IP of MDM server to a public IP to enable this. If all the devices managed are within the LAN, this requirement is not needed. 2195 - Should be open at the firewall/ proxy for the MDM server to reach the APNs. Host address: gateway.push.apple.com. 5223 - If the mobile device connects to the internet through the Wi-Fi, then this port should be opened. For better security, you can restrict these connections on the IP range 17.0.0.0/8. If all the managed devices have access to cellular data network, this requirement is not needed. NOTE: If your wifi is behind a firewall or you make use of a private Access Point Name for cellular data, then ensure access has been provided to the specific ports. 443 - Used for secured communication between the MDM server and the FCM server. Port numbers 5228, 5229, 5230 should be open on the firewall, If the mobile device connects to the internet through WiFi. This enables communication between the mobile devices and the FCM.